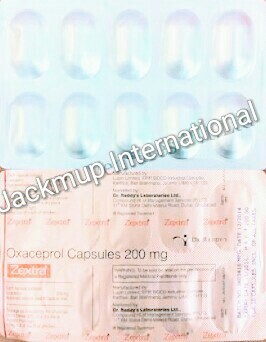 Description:- Zextra 600 mg tablet is used in fever, headache, arthralgia, myalgia, dental pain, post operative pain, pain during menstruation, osteoarthritis, rheumatoid arthritis, ankylosing spondylitis and gout.It is a non-steroidal anti-inflammatory drug (NSAID). It works by blocking the release of certain chemical messengers that cause fever, pain and inflammation (redness and swelling). Consult your doctor for advice if you have or had kidney/liver disease, diabetes, stomach or bowel problems (bleeding, perforation, ulcers); history of swelling or fluid buildup, difficulty in breathing (asthma), growths in the nose (nasal polyps), or mouth inflammation, high blood pressure, blood disorders, bleeding or clotting problems, heart problems, blood vessel disease, dehydration or low fluid volume or low blood sodium levels. Tolmetin can cause dizziness or drowsiness. Do not drive or operate any machinery or engaging in activities requiring mental alertness and coordination, until you feel fine. Do not drink alcohol or use medicines that may cause drowsiness while you are using tolmetin as it may have an additive effect. You may need to undergo certain lab tests (kidney function, complete blood cell counts, and blood pressure) to monitor your condition or check for side effects. If tolmetin use results in upset stomach, you may need to take it with an antacid. Continue taking tolmetin as directed as it may take several weeks or longer for you to feel the full benefit of the medication.